The Japanese organization Kuentai, which seeks to gather the remains of Japanese soldiers who fell in World War II, bring them home to their families, and lay them to rest, held a second memorial service last Friday at the Aqua Resort Club parking area, which has been found to be a final resting place for many Japanese soldiers. The memorial service last Friday sought to honor the thousands of American and Japanese soldiers who lost their lives on Saipan during World War II. According to Kuentai secretary general Usan Kurata, the entire island of Saipan is a mass burial site and harbors the remains of many American and Japanese soldiers. Thus, Friday’s ceremony was intended not only to remember the fallen but also to purify the area. The Aqua Resort area holds one of the biggest mass burial sites on Saipan. Based on its research, the Kuentai organization discovered that after the Banzai attack of 1942, thousands of fallen soldiers were bulldozed into man-made trenches in the area. The ARC parking area was one of the biggest trenches that were uncovered. 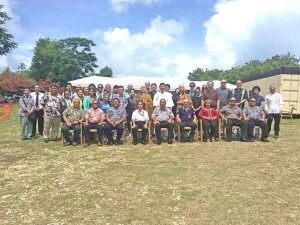 Last Friday’s ceremony was joined by not only the members of the Kuentai group but also by war veterans and government officials like Saipan Mayor David M. Apatang and Japanese Consul Kenji Shinoda. Kurata, who is also a Shinto priest, started the ceremony with a Shinto purification ceremony for the entire area and for those who attended the ceremony. After the purification ritual, Buddhist priests Hakuga Murayama and Kouya Matsuoka gave a prayer for the deceased and offered incense. The entire audience also offered incense during the ceremony.